On Sunday, I watched the match between last season’s champions Asante Kotoko FC and Amidaus Professionals FC, the newly promoted team from Tema. It was an interesting match between the largely disappointing Kotoko and the disciplined, hard-working Amidaus. Last season, Abdoulaye Soulama (born 29.11.1974) was first choice goalkeeper for Kotoko. The veteran from Burkina Faso sat on the bench, somewhat of a surprise to me, and Isaac Amoako (born 20.08.1983) wore the number one shirt. Amoako, who played only six matches during the GLO Premier League 2011-2012, had a good game and seemed very confident when he picked out crosses and long passes. Amoako is an intelligent goalkeeper who reads the game well, sometimes acting as a “sweeper” when the opponents manage to breach the defensive line. At left-back, Kotoko preferred the talented Gideon Baah, who struggled with injuries last season, playing only six matches. Baah is known for his cultured left-foot – a left-foot that needs to be adjusted as few of his crosses and corner-kicks found teammates. However; I am pretty sure that Baah, who is highly regarded at the club, will have a wonderful season. He is the natural replacement for Abdul Rahman Baba (born 02.07.1994), who joined SpVgg Greuther Fürth (Germany) in July. As “always”, the aggressive Yaw Frimpong (born 04.12.1986) was found at right-back. From my point of view, Frimpong is the best full-back in the league and his overlapping runs is always a joy to watch. Frimpong failed to impress against Amidaus and was rarely seen on the right-flank. The dependable Henry Ohene Brenya lost his central defensive partner Mohammed Awal (born 01.05.1988) to Maritzburg United FC (South Africa) during the summer. Kwabena Adusei, signed from Medeama SC, seems to be an excellent replacement. Adusei is a no-nonsense centre-back and against the lively attackers of Amidaus, he focused on safety first. Adusei is tough and powerful and is known for thunderbolt shots, which he will hopefully demonstrate later on in the season. The workaholic Michael Akuffo (born 18.12.1985) and new recruit Issah Yakubu played together in midfield. Yakubu, signed from Liberty Professionals FC, is a classical box-to-box midfielder, covering every inch of the pitch. Michael Helegbe (born 15.09.1985) played as a deep-lying playmaker, trying to attack from a withdrawn position. Helegbe, who also featured for Liberty Professionals FC last season, is a skillful player with experience from European football (SK Brann, EA Guingamp, KV Oostende). Helegbe was substituted for Michael Mensah, a hard-working striker. New signings Richard Mpong (born 04.07.1990) and Ransford Osei (born 05.12.1990) played at the wings, changing constantly between left and right, trying to confuse the Amidaus full-backs. Mpong, signed from Medeama SC, is usually a wonderful winger, known for dazzling runs and pinpoint crosses, but he failed to create anything at all in his Kotoko debut. He will surely come back stronger. Mpong was substituted for Iddrisu Nafiu (born 12.06.1986), the burly striker. Osei, arguably one of the biggest talents in Ghana when he was 16-17 years old, has played professionally at Maccabi Haifa (Israel), FC Twente (Netherlands), Granada CF (Spain) and Bloemfontein Celtic FC (South Africa). 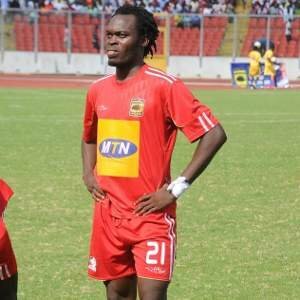 Osei failed to break through in any of these clubs and he needs to re-launch his career at Kotoko. The petit winger, who can also play as a striker, seems to lack confidence and finshing skills. He seemed uncomfortable when he got in scoring position and although he worked hard and showed some pace, Osei had a rather poor debut for Kotoko. Osei was substituted for Nurudeen Ali (born 16.05.1991), signed from Berekum Chelsea FC. Ali needs to work with some of the same areas as Osei; he is lively, hard-working and pacy – but largely ineffective. Up front, Kotoko chose in-form Kofi Nti Boakye (born 05.04.1987). Boakye, who also captained his side, has scored regularly in pre-season and I was therefore surprised to see how deep-lying he was during the match. Call me conservative, but a striker like Boakye should be found in the box and not dwelling in midfield. I was impressed with Amidaus Professionals FC although I struggled to get a good impression of most players, primarily because the numbers on their white shirts was almost impossible to read. However; a couple of players stood out. Eric Ofori Antwi was largely impressive in goal and was a calm, rock-solid performer. At times, right-back Kofi Koomson was simply brilliant. Koomson, formerly of Tema Youth FC, is a modern-style full-back with heavy emphasis on the attacking play. In September, Koomson was training with the Ghana U-20 national football team. I was also impressed with the strong, hard-tackling centre-back Aminu Alhassan, so far an unknown player to me. Nana Yaw Afriyie (born 08.11.1992), signed from Medeama SC, could become a key player during the season. Afriyie is comfortable at right-back or centre-back. Emmanuel Ofori Teyehugmeh (born 07.10.1992), who failed to break through at Tema Youth FC last season, played at left-back. In midfield, Richmond Adongo fought hard, made smart passes and always seemed to know what to do with the ball. Adongo played for Eleven Wise FC during the GLO Premier League 2009-2010. Adongo was substituted for striker Isaac Komieter (born 30.04.1987). Mohammed Yahaya (born 17.12.1988), on loan from Asante Kotoko FC, was captaining Amidaus from his central midfield role. Yahaya has a lot of quality and wins a lot of balls. However, he did not seem like a team player and he often chose to finish when he should have passed. It is quite obvious that Yahaya will be essential for Amidaus this season. Yahaya was substituted for Evans Nyarko, formerly of Wassaman United FC. The picture is of Yahaya and was found on citifmonline.com. From my point of view, Isaac Amoah was the man of the match. Amoah, playing as a lone striker, ran for 90 minutes, fought like a lion and always seemed dangerous when he got the ball. There were two players called “Isaac Amoah” playing in the GLO Premier League 2011-2012, but I am pretty sure that the Isaac Amoah of Amidaus is the same Isaac Amoah that played for neighbours Tema Youth FC last season, scoring three goals. Benjamin Arthur, Emmanuel Morgan and Joseph Quansah also started the match for Amidaus. Unfortunately, I was not able to get an impression of these players. All three players were part of the team that won promotion last season. Quansah was substituted for attacking midfielder Rennell Adjei (born 16.12.1991), formerly of Liberty Professionals FC and Enköpings SK FK (Sweden). Who wrote this article and how do I get in contact with him please ? Emmanuel Ofori Teyehugmeh…..is a great player and a boy to watch…..